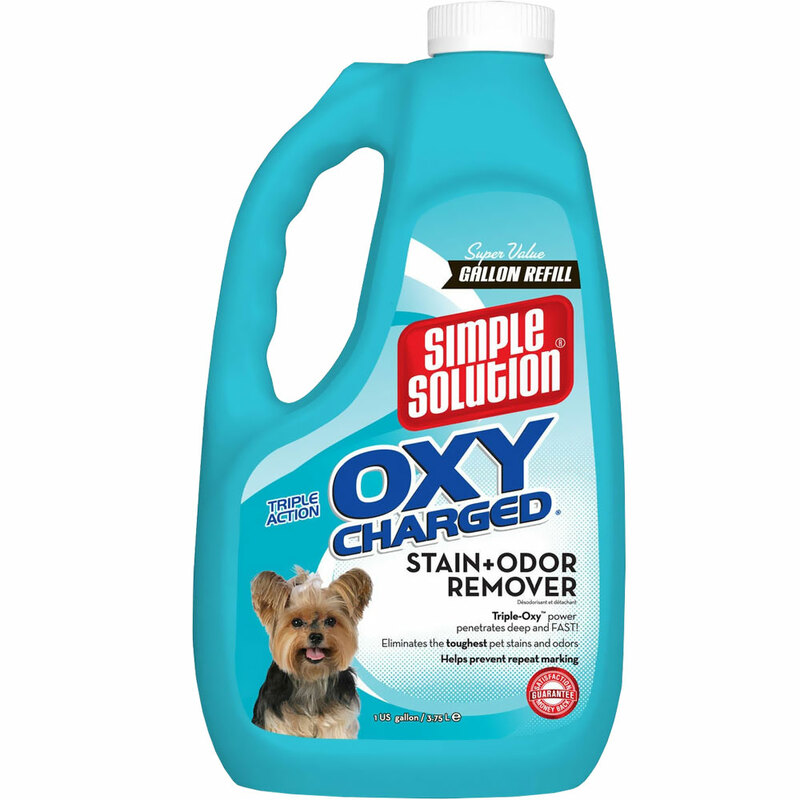 Simple Solution Oxy Charged Stain & Odor Remover Spray has a triple-strength formula that will quickly and permanently remove the toughest stains and pet odors from your home including urine, feces, vomit, blood, wine and more! The spray is safe to use on furniture, carpets, bedding, and any other surface in your home that is water-safe. Simply saturate the soiled area and the formula will work its magic for an easy and convenient odor removal! Before Use: 24 hours prior to using, test on an inconspicuous area. Remove excess solid or liquid waste. Shake well and test for colorfastness on a hidden area. Do not use on wool or leather surfaces. 1. Saturate the soiled area. When treating carpet, cover twice the size of the mess and saturate the carpet backing and padding. 2. Wait five or more minutes. Blot excess moisture with a color-safe cloth or paper towel. 3. Allow the area to dry naturally, which may take 24-48 hours. When dry, the stain and odor will disappear, guaranteed. If the area is dry but an odor persists, the odor source was not completely penetrated. Re-treat and be sure to completely saturate the soiled area to penetrate the odor source. Laundry Pre-Wash: Saturate the soiled area and let sit five minutes, then wash. Warnings: Skin contact may cause local discoloration and irritation. In case of skin contact, wash area thoroughly with soap and water and seek medical attention if irritation persists. avoid eye contact; product may irritate eyes. In case of eye contact, flush thoroughly with water for 15 minutes and seek medical attention if irritation persists. Keep this and all cleaning products upright and out of reach of children and animals. This product contains hydrogen peroxide. Wear gloves while using to avoid skin contact. Do not use with product containing bleach. Safe for use around pets and children when used as directed.